The world of healthcare data analytics is vast and can encompass a wide variety of organizations and use cases: from hospitals to medical equipment manufacturers, emergency rooms to intensive care units. And while some of the dashboard metrics tracked by healthcare organizations can be fairly similar to the ones monitored in other industries – such as finance or marketing – the use of business intelligence in hospitals presents a unique set of potential insights that can help physicians save lives by providing more effective and resourceful care to patients. This article will examine a number of ways in which visualizing healthcare data can help physicians and management gain a better understanding of going-ons within hospitals, and suggest ways to visualize commonly tracked metrics. But first, let’s understand where this data is coming from. Electronic Medical Records (EMR) – these are essentially a digital version of the patient’s paper chart, used by clinicians to monitor the patient’s condition, treatments he or she is due for, etc. These are usually kept within the bounds of the facility in which the patient is being treated. Electronic Health Records(EHR) – a broader set of digital records pertaining to the patient’s overall health, including information regarding previous treatment administered by other healthcare providers, specialists, laboratory tests and more. These would typically move with the patient and be shared by various providers. Specific departmental data – gathered by specific divisions or units within the healthcare organization. Administrative data – collected in Healthcare Management Systems (HMS) and looks at the hospital’s overall operations. Would typically be used by a hospital’s senior managerial staff and may include information regarding matters such as resource utilization and human resources. Financial data – often stored in proprietary financial management systems for larger organizations. As you can see, many healthcare providers often find themselves working with many disparate data sources. However, there can often be unique benefits in connecting data stored in these various sources to find correlations between them. Consolidating the data can be done in an enterprise data warehouse, which is a project best undertaken by heavily staffed IT departments. 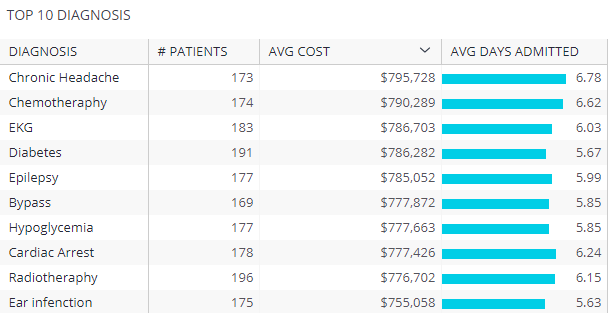 Looking to see healthcare dashboards in action? Check out our interactive dashboards. Once you’ve gathered all the required data and undergone the prerequisite data modeling steps, you can start looking at effectively monitoring key hospital analytics metrics and thinking of insightful ways to visualize them in a healthcare dashboard. Here are a few healthcare analytics examples, with the disclaimer that these are by no means the only things a hospital would generally be looking at, nor necessarily the most crucial ones. For the purposes of this article we’ve used sample data. You can click on any image to enlarge. This is a very simple visualization, but nevertheless one that can help hospitals understand how their financial resources are being utilized. By using a bar chart we immediately provide additional information that might have been more difficult to notice in tabular format – such as shifts in the relative costs between departments, as well as peaks that could indicate an issue that needs to be addressed, or at least further investigated. This visualization gives us a clearer idea of trends and outliers, and some people might find it more intuitive to examine the data regarding to a specific department in this format – the significant information becomes more apparent immediately. However, this is largely dependant on what the viewer’s emphasis is on when examining the data. This visualization gives us a single-glance view at data from several different sources. In our sample dataset, we had to join data from admissions, divisions, and ER tables. Combining these datasets gives us a clearer idea of hospital resource utilization by examining the amount of patients being admitted to the emergency room and the average time these patients spend at the hospital. This sets the way for further investigation into peaks, trends, and patterns. Here we’ve kept the data in tabular form. However, by combining financial and administrative data with departmental records, we gain the ability to quickly get answers to specific questions which can shed further insight into the various treatments being administered and how these affect hospital finances and room availability. Applying filters will enable us to examine specific dimensions such as region, time or facility. If your organization bases its budget around donations, like so many do, it’s important to track trends in order to understand how to plan for the year ahead. 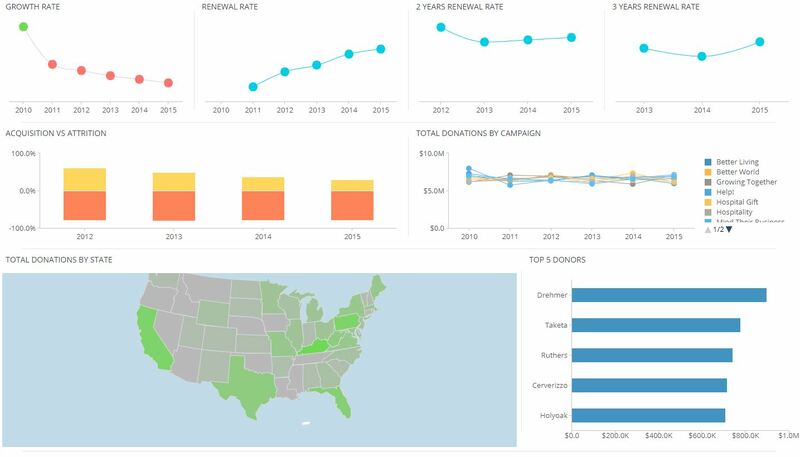 A donations dashboard can help you to find ways to increase engagement of donors and ensure financial stability. If donated amounts are different from what you expected them to be or change dramatically you can analyze the retention level of donors and find ways to engage more.